From the Batman v Superman Dawn of Justice collection by Westland Giftware. 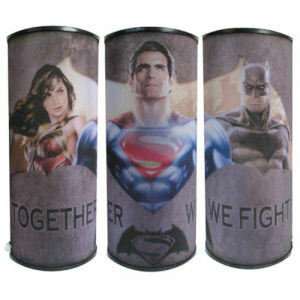 Batman v Superman Dawn of Justice Together We Fight Cylindrical Nightlight. From the Batman v Superman Dawn of Justice collection by Westland Giftware. Batman v Superman Dawn of Justice Together We Fight Cylindrical Nightlight. Requires 4x AA batteries(not included). Comes with a 39 inch chain for hanging.